Overcast but dry conditions greeted the Moto3 riders in Brno for the opening qualifying session of the day, and Alex Rins continued to make his mark on the second half of the season. After winning the last two Grand Prix in the class the Estrella Galicia man continued the momentum to dominate and take pole ahead of nearest rival Maverick Vinales. Alexis Masbou’s last charge pushed him up to third to complete the front row for Ongetta-Rivacold. Jack Miller rode through the pain barrier – he has had collarbone surgery since Indy last weekend – to finish fourth for Caretta Technology, though Masbou was top Honda this time. Also suffering with his foot in fifth was championship leader Luis Salom, the best placed of the Red Bull KTM team. Rins’ team-mate Alex Marquez took sixth after a late crash ahead of 2012 Brno race winner Jonas Folger in seventh for Aspar. Eighth went to Arthur Sissis, with the Mahindra’s of Efren Vazquez and Miguel Oliveira completing the top ten. John McPhee had his best qualifying to date in eleventh for Caretta, just ahead of local rider Jakub Kornfeil in twelfth. Moto2 saw mixed fortunes for the frontrunners, with Takaaki Nakagami taking pole with relative ease for Italtrans, ahead of Pons team-mates Pol Espargaro and Tito Rabat. 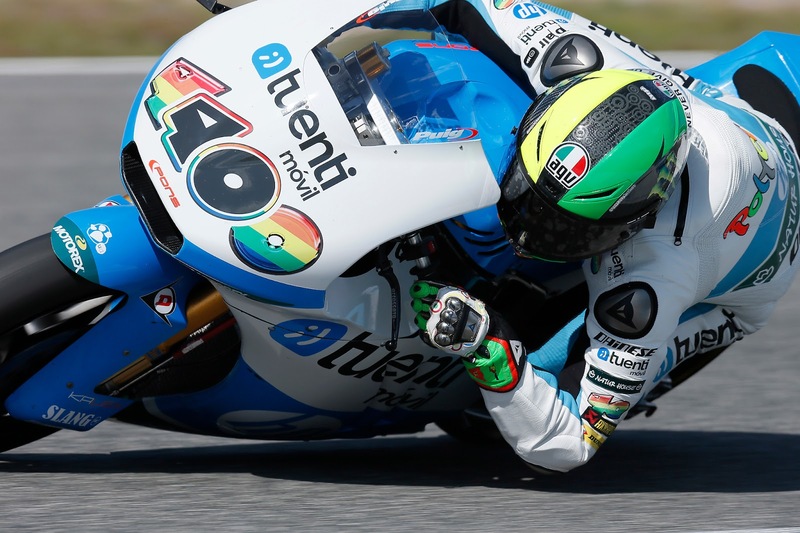 Both the Tuenti HP 40 riders clocked the same time, with second being awarded to Espargaro as his next best time was faster. Espargaro will be looking to take some serious points out of Scott Redding’s lead after a tricky start to the weekend left the Brit down in 13th. He was outgunned by his Marc VDS team-mate Mika Kallio who took fourth ahead of Moto3 champion Sandro Cortese in fifth, his best qualifying to date making for an all Kalex top five. The fastest Suter belonged to sixth place sitter Jordi Torres ahead of Came Iodaracing’s Johann Zarco in seventh and Interwetten Paddock rider Tom Luthi in eighth. The top ten was completed by Aspar rider and twice 125cc Brno winner Nico Terol in ninth and Technomag carXpert’s Dominique Aegerter in tenth spot. Tech3’s Danny Kent was the highest qualifying Brit on the grid in 12th -one place ahead of championship leader Redding. Gino Rea has a wild-card for Brno and will start from 29th on the grid on the only FTR.